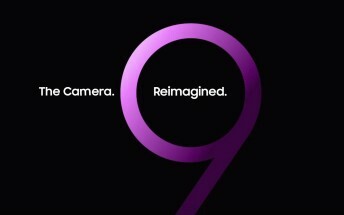 Samsung has released another quick video teaser for the upcoming Galaxy S9 and Galaxy S9+ this time focusing on the camera in its entirety. The previous promo video teased the new slow-motion and low-light abilities of the Galaxy S9 camera, this one hints at better selfies, selfie video, some sort of Snapchat-like animation effects (like the ones the Galaxy S/S8+ already have), flash and low light photography and finally Boomerang-like warp videos. The word reimagined suggests that Samsung's new flagship camera(s) will be much more than just refined, but will be completely different. Given that the S8 already had a very capable camera this could be properly exciting.